Most of our archery clients ask to book their hunt at the peak of the rut. However, I would much rather they hunt the pre rut when bucks are still following more of a set routine. I hate the unpredictability of rutting bucks and actually believe it fortunate that Iowa’s deer gun season begins after the peak of the rut, although the longer I deal with these Hawkeye whitetails, the more convinced I become that, for them, the rut is an open-ended proposition. Only the bucks themselves seem to know for sure when they are in the mood. In prime whitetail habitat, there typically are many more breeding-age does than mature bucks, and that lets the bucks string out breeding season. The higher the ratio of does to bucks, the longer a mature buck may stay in rutting mode. Last January, at the tail end of Iowa’s late muzzleloader season and after the last of our clients had gone home, I was up in a tripod stand watching a crossing below a pond between two sections of timber. The deer were using the crossing primarily to move up into a harvested cornfield, where they fed on the waste grain. Maybe a half-dozen does and a couple of young bucks were in that field when a big doe came busting out of the timber. She was definitely not a late-blooming yearling but rather a big mama in the neighborhood of 200 pounds. A few minutes later, a no-doubt-about-it shooter buck followed hot on her tail. So much for trying to time the rut. As soon the buck was in sight, the doe headed straight for the cornfield at a full run, with the buck right behind. I already had my Knight muzzleloader steadied on the tripod stand T-bar rest, waiting for a shot. But the deer never paused, disappearing back into the oak brush and sumac thicket surrounding the field. A few minutes after that, the pair emerged, this time headed my way. But before I could get the scope on the buck, they both disappeared again, this time behind a weed-covered berm about 100 yards in front of my stand. “Man,” I muttered to myself, “I hate trying to hunt rutting deer, and now I get to deal with a pair of ’em in the dead of winter.” It was colder than a well digger’s patoot on that stand with 4 inches of snow reflecting what little heat the watery late-afternoon sun gave off. Needless to say, I was wondering where the deer might appear next when the doe came bolting over the berm headed for a trail across the face of the dam, less than 50 yards away from my stand. The buck came out on her tail, and when he was maybe 75 yards away, I grunted loudly, hoping to stop him for a shot. This time he skidded to a halt, and I squeezed the trigger. In addition to only getting one shot, the cloud of smoke that obscures everything following that shot is another challenge with a muzzleloader, making it impossible to see how the deer is reacting to what you hope was a good hit. This buck busted out of the smoke headed back the way he had come. I was beginning to doubt the slam-dunk shot when he piled up at the edge of the berm. Starting in early October, before the pre rut is even underway, my partner in the outfitting business and I spend most mornings and evenings scouting our leases. We are invariably taken aback by the regularity of the early-morning and late-evening movements of the bucks we find and follow. At one particularly busy crossing, they move through a bottleneck of timber on their way to an evening feeding area where does also congregate. Then, the next morning, the bucks move back into the timber where they predictably bed along one of a few trails. We rely on such sightings and also trail camera images to set up stands overlooking the travelways, watering holes and other locations where we pattern consistent buck movement. And we always comment on the fact that if we just had some clients in camp, they could score on these pre-rut bucks if only because of the predictable nature of these movements. However, regardless of what we tell them, most of our bowhunting clients still book during the rut, and over the years, we’ve narrowed our bowhunts down to the last week in October and the first two weeks in November, to take full advantage of the pre rut while also fulfilling those requests. We adapt our hunting methods to hopefully overcome the increasingly random movement of the bucks as the rut heats up. We also find that the deeper into the rut, the less antler rattling seems to interest the bucks. Only makes sense, as they are shifting from sparring mode into breeding mode. Grunt calling, however, continues to elicit interest and continues to do so until the season ends. In fact, I frequently grunt-call rutting bucks to within easy bow and muzzleloader range from distances you might find hard to believe. As long as the wind is right, grunts and doe bleats may reach the keen ears of bucks that are clear out of rifle range, including some you don’t even know are out there. If the client is capable and so inclined, I recommend making soft grunts and bleats every half-hour or so all day long, and I believe many a client has tagged a nice buck during the midday lull by persisting with these calls. I also believe in the effectiveness of decoys at this time of the season, and a number of our very best bucks have been taken by combining decoys with grunts and bleats. Deer decoys are bulky and can be a pain to carry in the field and deploy, which is why many hunters give up on them if they don’t get the desired result. But we have seen more than enough success over the years to stick with it as a standard part of our rut-hunting setups. 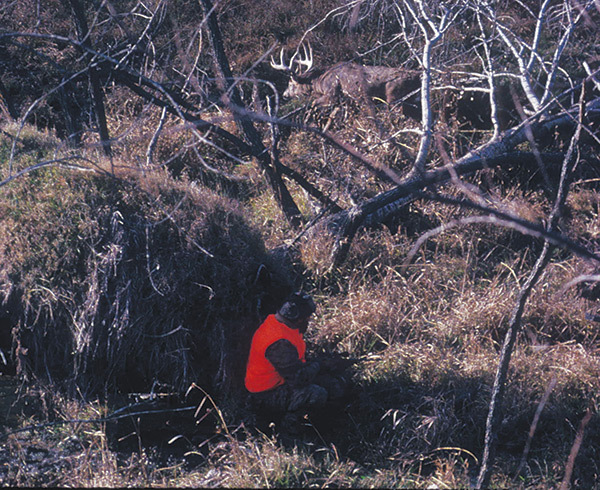 The best combination we’ve found for pulling a rutting buck off course and into bow range is placing a buck decoy facing the blind or stand at 25 yards or so with a doe at half that distance, set up broadside to the shooter and off to one side—to the right for a righty and to the left for a lefty. We may also place a Feather Flex fawn decoy in front of the doe. This lightweight little decoy is held by a single stake, and that allows it to swing in the slightest breeze. This movement adds to the realism of the setup. However, we do plant a stick or thick-stemmed weed on either side of the decoy’s rear end, about a foot apart so it can still move but not swing completely around, which, of course, would not mimic lifelike movement by a deer. Decoys are most effective in open areas with maximum visibility, and I’ve seen more than a few rutting bucks respond from a half-section away. The old saw that a whitetail lives and dies in the same square-mile section doesn’t apply to a buck in rut, not when it may chase does 5 miles or more out of its home range. One of the advantages we hold as professional outfitters is the fact that we have the time to keep scouting throughout the rut. On a number of occasions, our clients have taken trophy bucks that we had never seen on the property before, simply because we did see them and were able to quickly improvise a stand. The third day of the first firearms season, I had all of my hunters on stand and was glassing an open hilly section of harvested corn bordered by CRP slopes when I spied a humongous buck casually feeding with a doe at the edge of the cornfield. None of us had ever seen this buck before, nor had we caught him on our trail cameras. Early that afternoon, I moved a hunter into a blind, and at 5 o’clock sharp, he shot the buck as it meandered out of the woods and started feeding again in the same field. The green rack measured 196-2/8. If you have a partner to work with, you may be able to do the same on your own, with one of you hunting while the other keeps on scouting. It can pay off big, especially during the rut. We see more bucks during the rut. But those rutting bucks can be maddeningly unpredictable, appearing and disappearing seemingly at random. This is why I have such a love-hate relationship with the rut. Sometimes the only thing a hunter can do is just stay out there and hope for a break. Opening day of Missouri deer gun season, I was in a walnut tree watching a pair of 170-plus bucks working the does on the far side of a tank dam pond. The sky was overcast, there was no discernible breeze, the air refreshingly cool, and the rut in full swing. In other words, it was a perfect morning to hunt deer. I had hung the stand the previous day, after minimal scouting. The entire property was only 140 acres, but every square inch offered something for deer, and the landowner told me it was posted and rarely hunted because of an inaccessible location. At the moment, the only downside to the situation was the 275 yards that separated my .50 muzzleloader from the nearest of the humongous bucks. That was “iffy” range even for the sleek saboted bullet and full powder charge in the barrel. However, the way they were chasing the does, I figured it was only a matter of time until one of them came into range. If I got lucky, one might even cross the dam, which would put it in point-blank range. A good bit of shooting just at daylight had sent a couple of lesser bucks scurrying by, and I figured there was little likelihood any deer would go back in that direction. After tempting and tantalizing me for an hour during which seductive doe bleats and soft grunt calling had brought the two lesser if still-mature bucks back by my stand, the big boys simply left their does and headed directly toward where the gunfire had erupted earlier. At 1 p.m., when all of the deer had departed the area around the pond, I climbed down and found a sunny spot in the weeds, where I munched a couple of Snickers bars and then took a snooze. I was back in the stand at 2:30 and spent a hopeful afternoon and then a frustrating evening watching one small buck and bemoaning the unpredictability of bucks during the rut. But no way was I going to give up on that stand, not with such bucks likely still in the vicinity. The following morning, I was back in the tree long before shooting light, and this time I brought a Model 70 chambered in .300 Winchester Short Magnum to back up the muzzleloader. With that rig, I felt comfortable shooting a deer out at 400 yards. By 8 o’clock, I had heard enough shooting to figure the locals had probably tagged every decent buck in the county, and my enthusiasm was waning fast an hour later when I finally caught a flicker of movement in the high blue stem on a far hillside, some 300 yards from my stand. One quick look with the binocs was all it took, as even at that distance I had no trouble making out heavy, high tines. The big buck vanished somewhere along the slope, but at last sighting, he had been headed my way. Ten minutes later, the deer materialized out of the brush less than 100 yards away from me. Before I could get the crosshairs on him, he once again vanished, this time in a narrow band of small trees bordering the pond. I readied the muzzleloader, figuring he’d reappear within easy range somewhere along that weedy shoreline. Wrong again. When he did reappear, he was at the upper end of the pond, the distance I had ranged previously at 275 yards. I quickly swapped the black-powder burner for the Model 70, got a solid rest on a tree limb, and bleated loudly. The instant the buck stopped and looked back my way, I took the quartering-away shot, crosshairs centered on the last rib. No reaction, so I held the same and took a fast follow-up shot. This time the big deer stumbled before once again disappearing in the brush. I had spent enough time at the range with that .300 WSM to know the shots had found the mark, and I took my time climbing down out of the stand. I found the brute piled up within 30 yards of where I had last seen him. As the saying goes, I would rather be lucky than good. But I would still rather hunt whitetails before the rut.